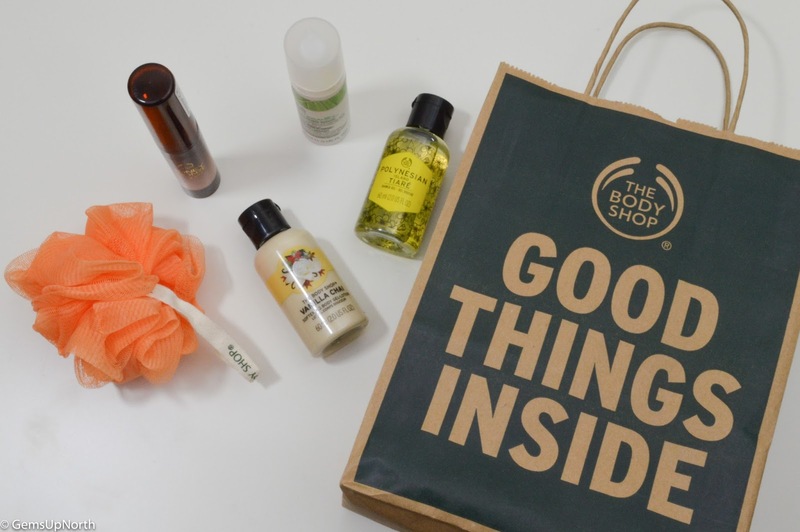 Last week I was invited to The Body Shop Bolton for an in-store bloggers event, I attended another event at the same store before Christmas which was lots of fun with demonstrations, product information, sampling products and a quiz at the end. The event last Thursday was just as informative but more focused on the launch of the new Liquid Peals. 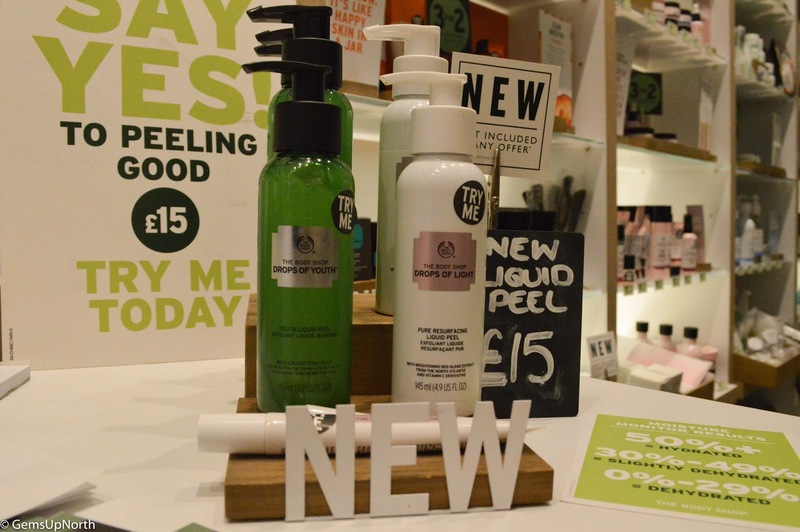 The Body Shop are launching the new Drops of Youth Liquid Peal and Drops of Light Pure Resurfacing Liquid Peal as well as the Drops of Light Pure Healthy Brightening Eye Cream and a Precision Eye Massager; all are available in stores and online. I picked up the Drops of Youth peal today and used my Love My Body club points that I had saved. 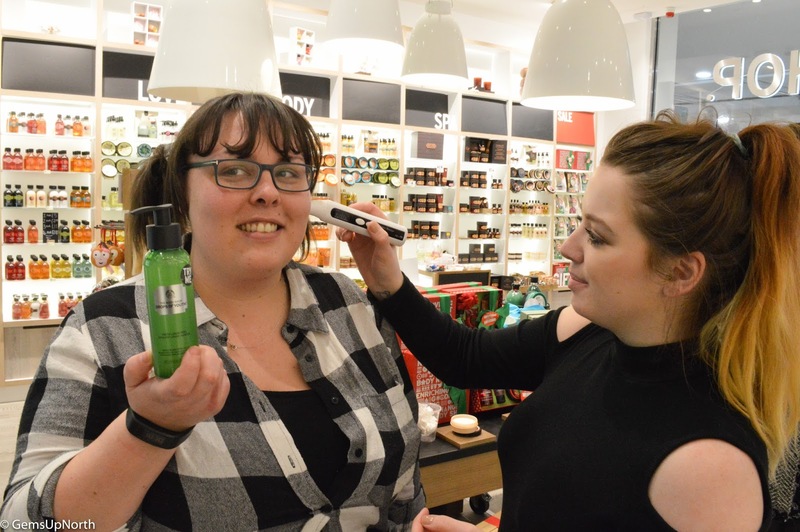 In store last week the Body Shop staff told us all about the new launches, the ingredients, what they are good for and let us try the product out ourselves. We all got to sample the Drops of Youth liquid peal on our hands and I was so shocked and amazed at the product; you can physically see the product working on your skin. The peal starts off as liquid then turns into a solid (gel to peal) and exfoliates the skin without any harsh ingredients. Both peals are a super alternative for exfoliating products and can also be used on sensitive skin; the staff told us the peals can be used two to three times a week. In-store the staff have a Moisture Monitor which can measure the amount of moisture in your skin, nearly all the attendees at the event had dehydrated skin but after using the Drops of Youth liquid peal the moisture was increased; so after just one use the product gets to work! 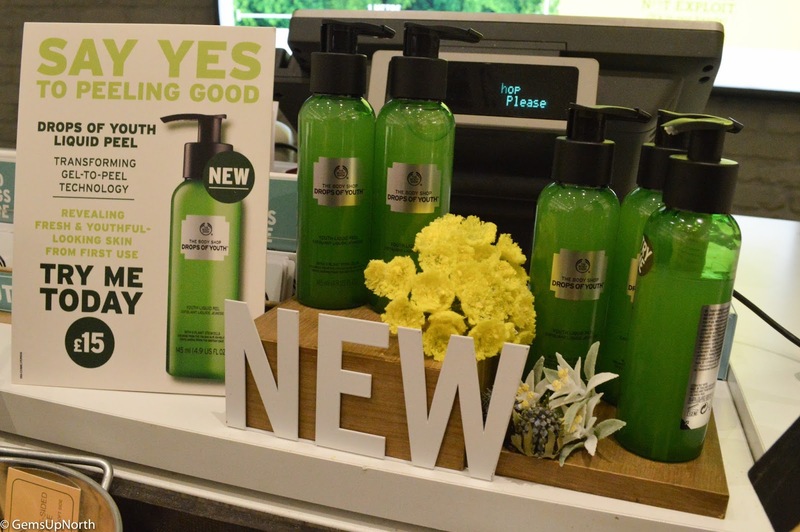 I am truly impressed with this innovative new product from The Body Shop! The Drops of Youth range helps the first signs of ageing and the range is getting bigger and bigger. This liquid peal is the product I sampled in store and was amazed by the results from just using on my hand. The peal lifts dead skin cells, impurities and pollutants whilst leaving a fresh and smooth result that's not harsh on my skin at all. The product's ingredients has three plant stem cells including Edelweiss, sea holly and criste marine, The Body Shop using natural ingredients increases my love for them. Only two pumps of the peal are needed to cover my face, I use this after cleansing and feel so fresh after using it; it's great to use in the morning for a wake up call. The Drops of Light range tend to be brightening products so are more suited to maturer skin but can be used by anyone if it suits your skin. This liquid peal not only removes dead skin cells and impurities just like the DoY peal but also visibly brightens your skin from the first use. The Red Algae Extract which is harvested in the North Atlantic helps to brighten the skin, the product is also rich in Vitamin C, minerals and nutrients. The trick is in the name and your skin should feel resurfaced after using this product. Again only two pumps are needed to cover your whole face and your left feeling fresh and 'resurfaced'. This eye cream is from the Drops of Light range as well and has a cooling metal applicator which feels so refreshing when it touches the skin. The applicator having this cooling effect helps to stimulate blood circulation which will help to reduce puffy eyes and give a brightened look. I personally liked this product as I've just become a fan of eye creams and this one is easy to use and the cooling effect had a positive impact on the skin under my eyes. The cream has the same ingredients as the DoL liquid peal with Red Algae, Vitamin C, minerals and nutrients. This is a nifty little tool that has a metal roller ball on one end which when used with eye creams/gels stimulates the blood flow so its a bit like the eye cream applicator but a different shape. At the other end of this tool is a spatula so you don't have to touch any products by hand which helps to stop germs getting onto your skin. According to the Body Shop website using the eye massager regularly, dark circles appear reduced as well as signs of fatigue and eye bags. For me this isn't something I will use enough to feel the benefits so I most likely won't be purchasing this but I do think its a good idea especially if you suffer from dark eyes and eye bags. 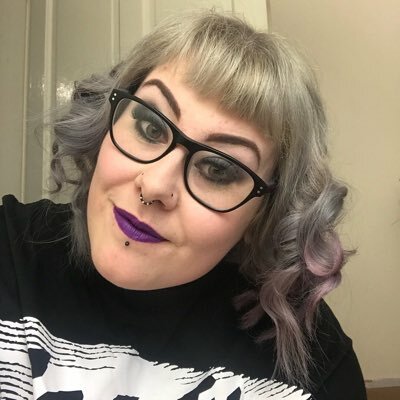 With all the information given on the night we was all pumped about the new products and the Body Shop staff had put together a quiz to challenge us. Me and my guest both smashed the quiz to be honest, we had listened well and was quick to answer. For each right answer the staff gave us a treat which ranged from travel bottles of shower gel, body cream and even a body puff. This gave the event an exciting finish and we all had a laugh before departing home to try our samples of Drops of Youth Liquid Peal. 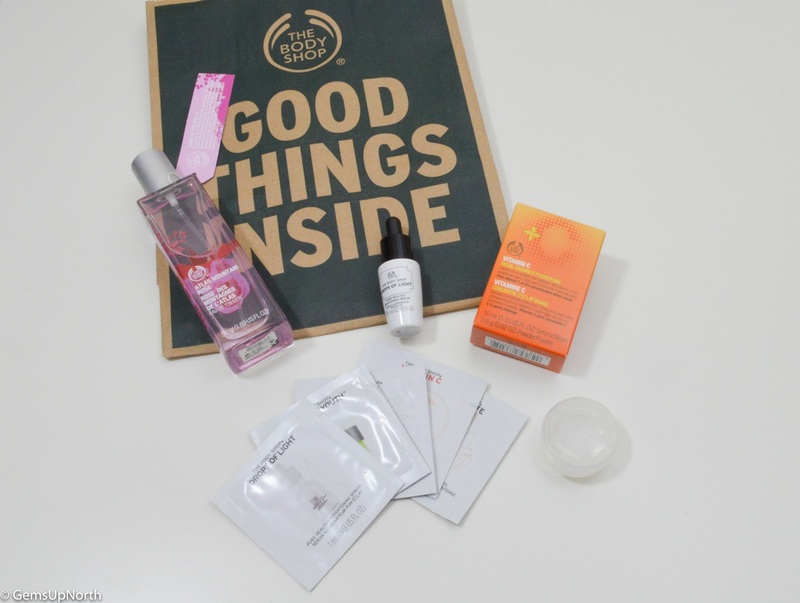 The staff had put together a little goodie bag for us to take home as well which was filled with samples of skin care and a bottle of Atlas Mountain Rose Eau De Toilette, thank you to the team at the Bolton Store for putting on an informative and fun event.